So down here in the Southern Hemisphere winter is almost upon us and this heralds the perennial popularity of two things in South Africa: Wimbledon and soup! Roger vs. Djokovic aside, in our house winter has always been a season defined by your preference in soup. Generally speaking I have always lent towards bowls of a refined nature, filled silky smooth soups without a suggestion of rustic charm, but in typical spousal aberrance my partner has always championed the opposite. 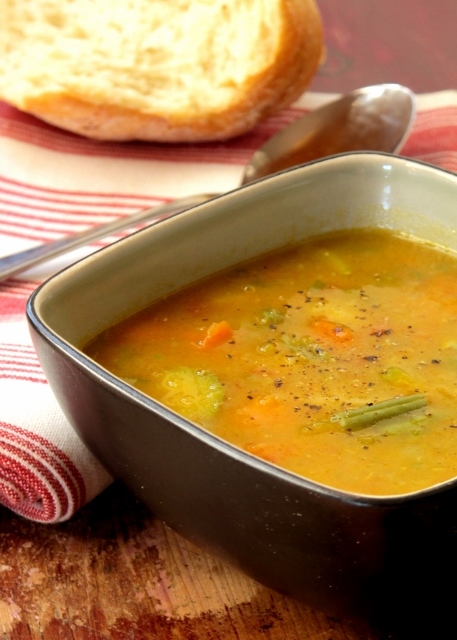 Chunky, vegetarian and woefully wholesome, his soup of choice is invariably the same every winter: minestrone. Ah, minestrone – how I’ve loathed thee. In tennis terms, ’tis the Murray of soups: interminably unlikable. However, culinary speaking I have always considered this simple Italian classic to be my ultimate soup nightmare; watery, insipid and chock-full of vegetables and beans, what’s not to hate? So with that said, it should come as little surprise that minestrone was the last recipe I expected to be talking about on my blog, but oh how things have changed. Quite unexpectedly I’ve made peace with my brothy nemesis and I find myself enamoured with this classic soup. So what’s changed? In a word, consistency. It turns out that the devil wasn’t in the details (i.e. the vegetables), it was in the viscosity. It seems that with just a bit of tweaking and fiddling, even the most dreaded dishes can find redemption through a few pulses of a hand blender. Okay, so I’ve also ditched the traditional additions of rice and beans in favour of pasta, but beyond that this recipe remains quite true to its classic origins. Note: I recommend adding some lightly browned chorizo as part of the final garnish, far from authentic I know, but damn, it tastes good. The first time I had these traditional Sicilian rolls was in a small Italian restaurant just off the main drag in Camps Bay. The moment I saw them on the menu I knew I had to have them. Not only did they sound utterly delicious, but just saying the dish’s name out-loud when ordering it made me feel thoroughly Italian! Sadly, in spite of its gloriously evocative name, I was actually less than thrilled with the meal, albeit it has been suggested that I should never eat out given my propensity for disappointment. Nevertheless, in spite of my culinary chagrin, I was convinced that the dish still had merit and that it was worth trying to recreate at home. After some obsessing and research, I eventually attempted my own involtini and I’m pleased to say that they didn’t disappoint! 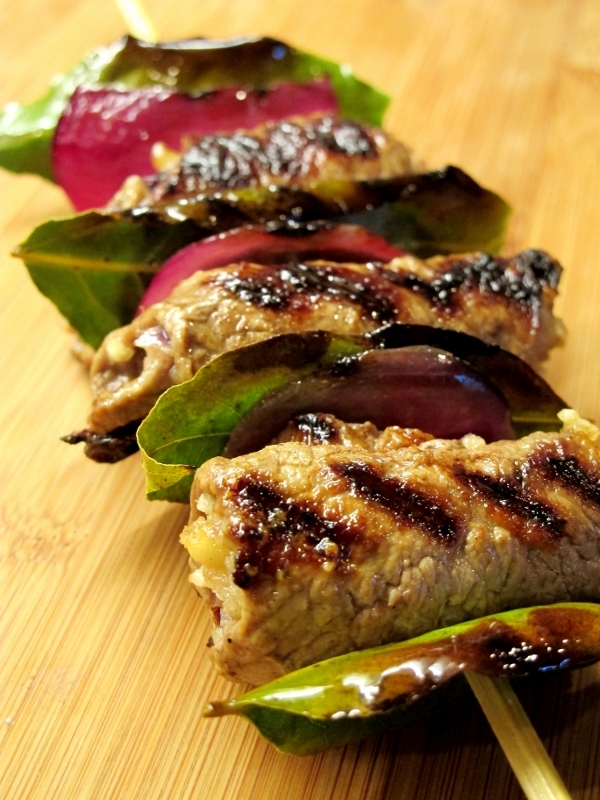 Whilst there are a myriad of versions of involtini out there, this particular recipe is very much typical of the involtini from the Sicilian capital Palermo. Loaded with ingredients such as toasted pine nuts, raisins, onion, bay leaf and pecorino, these rolls are wonderfully aromatic. Another filling option is to include some pepperoni, as they do in the region around Catania. Given the wide range of regional variations, feel free to play around with the filling – chances are it will still be delicious! With regards to what to serve with your involtini, I would recommend pairing them with some Swiss chard sautéed with a few mushrooms, some garlic and a splash of white wine or vermouth. Add a few slow-roasted cherry tomatoes and you’ll have a veritable feast! 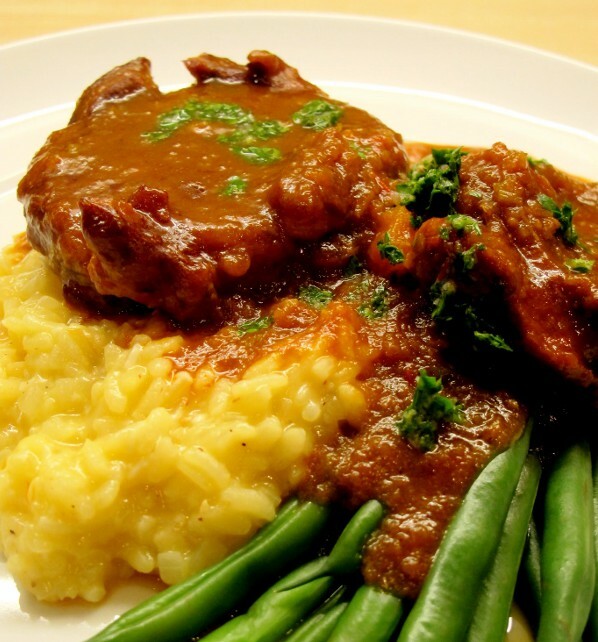 Arguably the figlio preferito of Lombardy’s regional cuisine, ossobuco is, perhaps, the ultimate Italian braise. This is not a dish for the fainthearted, this is real stick-to-your-ribs fare! I would categorise ossobuco as lick-your-plate food, something that, even in the politest of company, I cannot help but do! Meat: Ossobuco should only ever be made with veal shanks. Unfortunately this isn’t really negotiable, as it simply would not be ossobuco if it was made with beef shanks, or perish the thought, lamb. Whilst the braise still works well with either beef or lamb shanks, you could not in good conscious call the dish ossobuco if you used either of these. Bone-marrow: Ossobuco literally translates as bone-hole, so it should come as no surprise that bone-marrow is an inescapable part of the dish. In fact, sucking out the tender veal-marrow is integral to the joy of eating ossobuco. If you are still haunted by Mad Cow disease, then this most definitely isn’t the dish for you! Accompaniments: In truth, ossobuco can be served with just about anything; whether it be with a crisp potato rosti or with buttery mash, it will be delicious. But just because it tastes good, doesn’t make it right! Traditionally ossobuco is always served with risotto alla Milanese and is typically garnished with a sprinkling of gremolata. Sometimes tradition knows best and this is such a time, the combination of all three elements is simply stellar! Even if you don’t serve it with the risotto, I would urge you not to skip the gremolata – it is very easy to make and elevates the ossobuco to an entirely different level. For aficionados there are, of course, a myriad of other do’s and don’ts: should tomato be added, red wine or white? To be honest, our pantries and situations do not always allow us the luxury of perfection so, rules or no rules, we have to make do with what we have available. As much as I absolutely love ossobuco, I usually have mixed emotions whenever I see it on a menu and I never order it lightly. Despite my mind being awash with those pesky “rules”, provided the basic tenets are adhered to, my leap of faith is invariable justified and I still enjoy my dining choice irrespective of my skepticism. Testament, perhaps, to ossobuco’s infinite variability and appeal. I guess you just can’t keep a good dish down! One of the ultimate “love it” or “loathe it” meals, Spaghetti alla Puttanesca is a dish accustomed to evoking passionate reactions in all those who dare eat it! Robust, seductive and “easy”, Spaghetti alla Puttanesca appropriately translates into English as “Spaghetti of the Whore”. In spite of its alarmingly rowdy name, puttanesca has probably less to do with salacious ladies of the night and perhaps more to do with its “trashy” ingredients. The dish is alleged to have been created by a restaurant owner in the 1950’s to appease some rowdy late-night patrons. As closing time was upon them, the patrons supposedly demanded the owner quickly whip them up something to eat, insisting that it could be made with “any kind of garbage (puttanata)”. 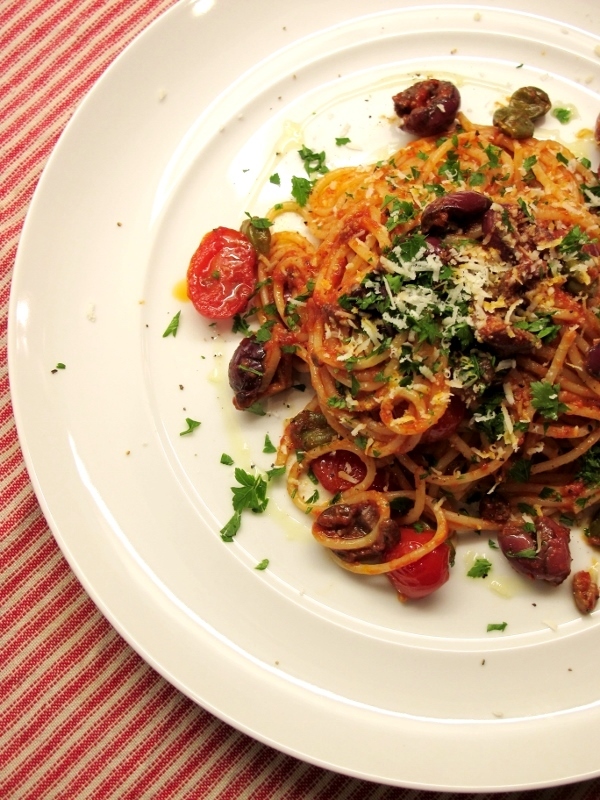 With just some leftover tomatoes, capers and olives, the obliging owner threw together a simple pasta sauce that would become the classic dish we now all know and love…or loathe. At least that’s the PG version of puttanesca’s origins and is perhaps nothing more than Wikiepdia-lore – we will never really know for sure. I, however, prefer to believe in puttanesca’s seedier origin-story as it speaks to the heart of the unrefined character of the dish. This is a pasta sauce born out of back alleys of Sicily, ordered with harsh whispers and eaten with the appetite of the insatiable and unsophisticated. 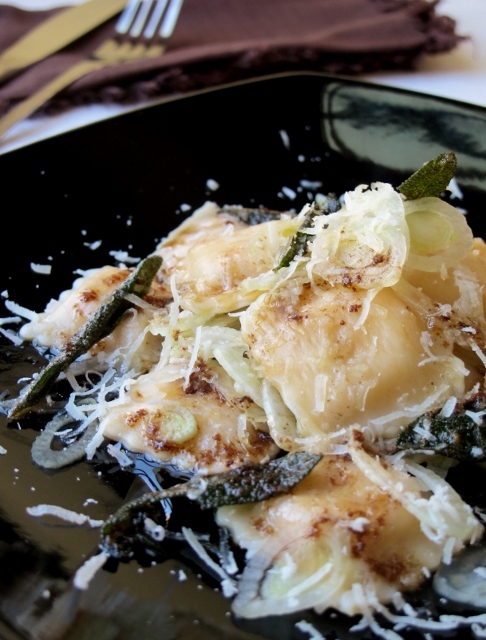 This is a dish that is as unapologetic and unrepentant as the women who reputably ate it. Puttanesca is a sauce that holds nothing back – there are few pasta sauces that pack this much of a punch with each mouthful. Coarse, salty and bordering on the uncouth, to my mind Spaghetti alla Puttanesca is indeed a dish that is aptly named! Aside from its history, the one other point of contention with regards to puttanesca are anchovies! Whilst I cannot imagine puttanesca without them, I must point out that the addition of these divisive little fish to the sauce isn’t always the norm. In fact, anchovies were a later inclusion to the dish and are still only used depending on regional tastes and variations. Outside of Italy though, anchovies are synonymous with puttanesca and I see absolutely no reason to advocate otherwise. Irrespective of which version of Spaghetti alla Puttanesca’s history you chose to believe, or whether you want it with anchovies or not, the next time you order it at a restaurant just bear in mind what you are really saying to the waitron. Depending on the neighbourhood you are in, when you utter the words, “I’ll have the puttanesca, please”, you might get more than you bargained for! The one thing that surprised me most about Italy is how simple italian food really is; nothing is added that isn’t necessary and ingredients are given the room to speak for themselves. In Florence we chanced upon a delightful local eatery called La Burrasca, just on the dodgy side of the Central Market. 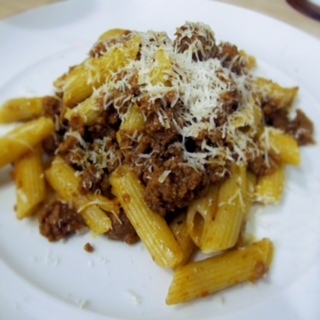 My partner, who has a famed aversion to all things “flavoursome” (with a particular loathing of garlic) fretted over whether the penne al ragu on the menu was cooked with the offending clove; after all this was Italy, they put it in everything. We asked our waiter if the ragu was made with garlic and his response was quite unexpected; “Of course not, this is ragu! It would not be ragu if there was garlic!”. Delighted, my partner ordered it and loved it. So much so, he ordered it three nights in a row! So the humble ragu taught me an important lesson in italian cooking: keep it simple. It seems the obligatory addition of garlic to all Italian dishes is a culinary assumption most of us are all guilty of making. Unsurprisingly, the Italians harbour an aversion to extraneous elements being added to their most treasured dishes. Why mess with Tuscan perfection? After all a ragu is a ragu and you don’t need to add garlic to make it taste italian. This is risotto’s ground-zero; risotto stripped right back to it’s bare bones of rice, stock and cheese – the basics. Risotto Bianco is, in essence, the root-recipe for all risotto but don’t be fooled, just because it’s simple doesn’t mean that it isn’t incredibly tasty! In this risotto, the cheese is the true star of the show; without any other strong flavours compete with, the parmesan takes centre-stage and boy, does it shine! A cheese lover’s dream come true, Risotto Bianco is blissfully velvety, coddlingly rich and packs a knock-out parmesan punch that leaves you wanting more. This is home cooked comfort food at it cheesy best. 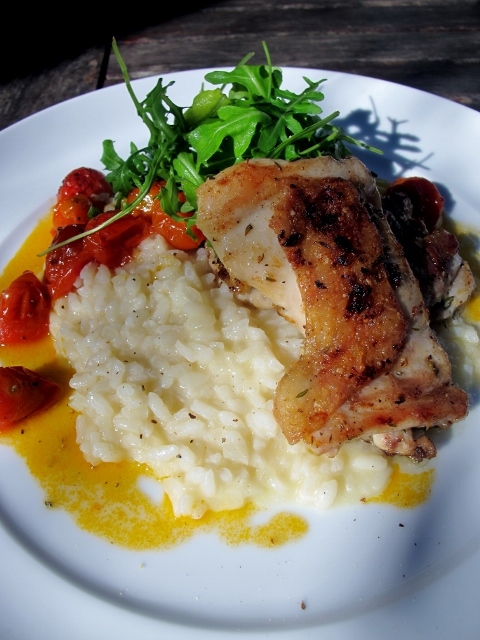 With a dish this plain, it is always tempting to add additional flavour elements to the risotto itself. If it were my risotto I wouldn’t, as this would detract from the essence of the dish but of course I’m not the person making your risotto; it’s your kitchen and ultimately you are in charge! However, if you do decide to add ingredients to the recipe just don’t go overboard. Personally, if I wanted to bring some additional elements to the dish, I would rather serve the risotto as an accompaniment to a main meal. Perhaps pairing it with something like grilled chicken breasts (simply marinated in garlic, thyme and lemon), some rocket and oven-roasted cherry tomatoes. Now I adore red wine, really I do but it has taken me a long time to get my head around the mere idea of risotto rosso. It’s not that I was adverse to using wine in cooking; like most of us, I regularly add red wine to braises and stews but to add it to a risotto? It just seemed wrong. And its not just me, generally people do seem a bit put off by the notion of a red wine risotto, which is a shame as it really does make for a delicious meal. I know this because I eventually tried it for myself and discovered that I was wrong, oh so wrong. One evening, whilst making a risotto, I was momentarily gripped by a flash of culinary adventurism and reached for the red and not the white! In a splash there was no going back, I was having ruby colored risotto for dinner! It wasn’t without trepidation that I took my first bite, followed by my second, then third – all too soon I was licking the plate (sorry, over-share)! It was incredibly tasty and satisfying, everything you’d want from a risotto. Risotto rosso works especially well as an accompaniment to most meat dishes, although I wouldn’t serve it with anything cooked in red wine as this would just be overkill. It is however, particularly good when served with a juicy steak and a rocket salad! A word of advice though, the wine will be the prominent flavor in the risotto so you really should try to use a decent red when making it!